Depends a lot on what you like to eat. Below is MY list of what I want to plant for a fall garden. Some of these are already growing in the summer garden and will be ready to harvest soon like the carrots and beets so I must decide if I want more in the fall. All of these planting dates are estimates depending on the variety you grow and are based on planting outside, not in a greenhouse. Look on your package of seeds or on the plant label for seedlings for accurate harvest times and go backwards from Oct 3 for Santa F+ add 14 days. Fennel (Finnochio-bulb type)-Sow seeds mid June. OPPS! Missed this. The short cool days of fall are even better for fennel than spring. You can still plant this (IN JULY) as it likes cool nights although the bulbs may be smaller since we missed it’s prime planting date. Asian Greens/Bok Choi- Sow seeds mid July. Can handle light frosts. Harvest days depends on variety. Look on seed package. Beets- Sow seeds in mid July-early August. Can handle freezes but must mulch with thick straw or row cover. 45-65 days to harvest. Broccoli- Sow seeds early July-mid July. Can handle light frosts. 55 days to harvest. Broccoli raab- Sow seeds in early July-mid July. Can handle light frosts. 45 days to harvest. Carrots- Sow seeds in early July-mid August. Can handle freezes but must mulch with thick straw or row cover. 70-80 days to harvest. Kale- Sow seeds early July. The short cool days of fall are even better for kale than spring. Kale that is established will last well into winter and can survive below freezing temperatures down into the 20s. Lettuces- Lettuce baby- Sow seeds in early-August. Seedlings will need consistent moisture and shade from the afternoon sun on hot days. Cover when it gets cold to extend season but it will not survive freezing temps. 45 days to harvest depending on type and variety. Radish- Sow seeds late July. 30 days to harvest. Spinach- Sow seeds early-August. The short cool days of fall are even better for spinach than spring. Spinach that is established will last well into winter and can survive below freezing temperatures down into the 20s although it will stop growing. Why doesn’t it freeze? It produces an alcohol inside-alcohol won’t freeze! 45 days to maturity. Endive, Escarole-Sow seeds early August. The short cool days of fall are even better for these than spring. Lettuces- Lettuce head – Sow seeds in anytime August. Seedlings will need consistent moisture and shade from the afternoon sun on hot days. Cover when it gets cold to extend season but it will not survive freezing temps. 45 to 60 days to harvest depending on type and variety. Mesclun mixes- Sow seeds in early-August. Seedlings will need consistent moisture and shade from the afternoon sun on hot days. Cover when it gets cold to extend season but it will not survive freezing temps. 45 to 60 days to harvest depending on type and variety. Arugula- Sow seeds in mid-August-late August. Fast growing. Can handle some light frosts. 30-40 days to harvest. Shallots-Sow largest bulbs anytime in October after the first frost. 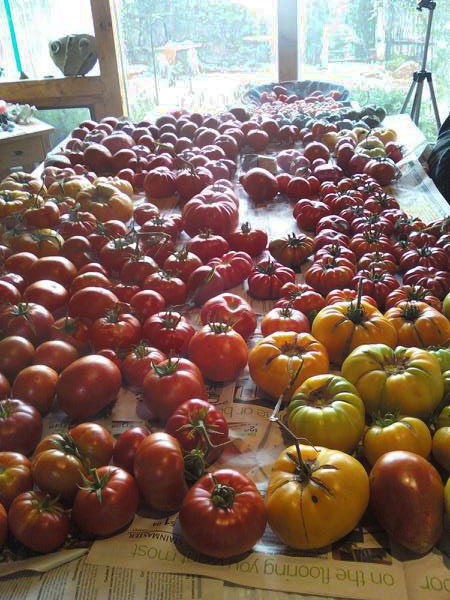 Harvest in late-June-July. I’m not a big fan of kale, endive, escarole and collards, but went ahead and listed them as I know many of you like them. Cabbage and cauliflower take too long to grow for me. Forgetaboutit! 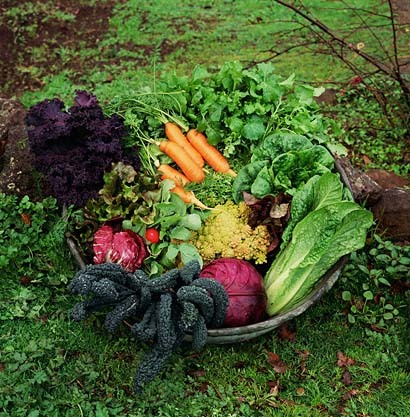 Do you have garden space close to your house for easy watering and harvesting as it gets colder? This is important to consider if your main garden is far away from your home. I have two places to plant them now. My cold frame and my raised beds up by the house. If I ever get my greenhouse done, I’ll have another great place for veggies but for now I’ll plant in my two spaces. My first space is my cold frame up by the house. Since it is too hot now, I think I will have to put some shade cloth over it to keep plants cooler inside. Also I want to get one of those automatic vent openers that will open the lid if the temps get too hot and close it when it gets too cold. My second space is the raised beds also up by the house. Raised beds are great as they keep the soil warmer in the fall when it is getting cooler. Since I already pulled all the garlic in these raised beds, I will plant a few cold hardy vegetables in them and then plant garlic and shallots between them come October. The beauty of having some garden space close to the house is when it does get cold, I won’t have to walk down to the main garden to water and harvest. I can just get a watering can and go right outside the house. 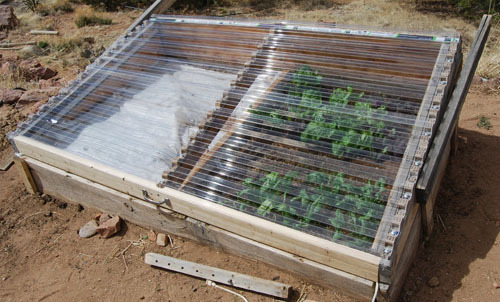 Also I can replace the light row cover that I keep my cool season crops under (keeps the critters and bugs away) with a heavy row cover on the beds if a sudden frost comes up. 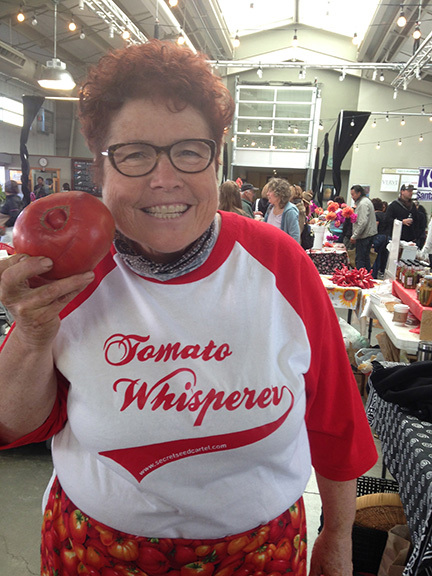 The cool season crops will be picked by the time winter hits and the garlic and shallots will sleep till spring! 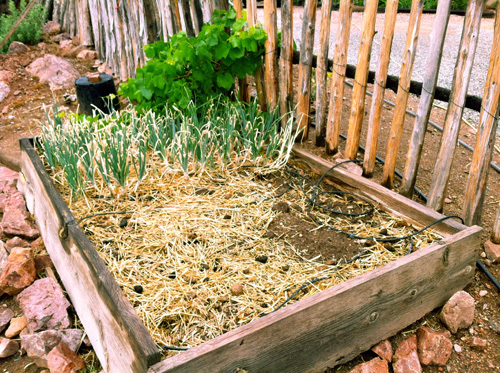 This entry was posted in arugula, BEETS, CARROTS, chard, Fall/Winter Planting tips, FENNEL, GARDENING TIPS, GARLIC, general, mesclun, PEAS, RADISHES, spinach and tagged fall gardens, fall vegetable gardening zone 5A, fall vegetable gardens for Santa Fe, Fall vegetable planting schedule. Thanks for the reminder Janine, I need to get working on my fall planting.